We often receive requests for custom products or modifications to existing products. When possible, we are happy to provide such services, time permitting. Modifications to existing products can range from simple firmware changes to complete hardware redesigns. We also design complete custom products to our customers' specifications. Some of these products are available for sale but are not usually sold through our dealer network. Pricing for custom projects depends on the complexity of the design and how many products will be supplied. 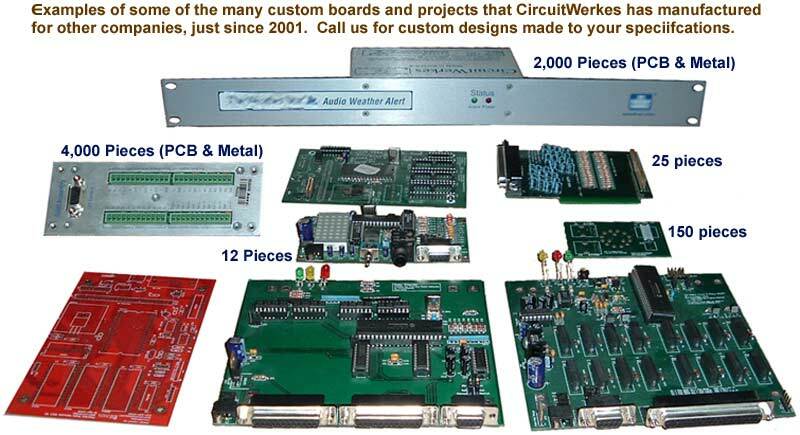 If you have a need for custom solutions, please feel free to contact our sales engineers for a quote at (352) 335-6555 or e-mail us at sales@circuitwerkes.com. A beep tone generator with balanced audio throughput. Interrupts normal audio and beeps three times when it gets an external contact closure (2,000 pieces were made for a major TV network). A serial data to relay converter for generating 16 contact closures from the Starguide-II receivers' data stream. Custom made for a large radio network. A DTMF decoder with a large LED matrix readout and serial data output. Custom made for a radio network that uses DTMF for in-house switching. An interface for connecting the I/O ports of a specialized PC to the outside world, including rf shielding, and FCC Part 15 certification for the entire project. 4,000 pieces were manufactured for a TV network. A DTMF decoder that latches a relay upon receiving a user programmable DTMF tone. Another DTMF tone releases the relay and other DTMF tones momentarily close relays. One use for this product was in teleconferencing. A telephone strobe that begins flashing when a call is received and continues until a reset button is pushed. Several hundred of these were made for a buying co-op. The MPC-2 - A very inexpensive, FCC part 68 approved, telephone DAA module that can be incorporated into other designs. The above products illustrate some of the many custom projects we've made over the years. Some of these products, like the MPC-2 , are kept in stock and can be purchased in single pieces. Others may require minimum orders to process. Custom hardware designs usually require a minimum of 50 to 100 pieces for full production, but sometimes orders as few as 5 or 10 can be supplied. If you would like to inquire about these products or one of your own, please give us a call.